On November 8-10, 2017, US President Trump took a delegation of nearly 30 CEOs from major American companies to make three-day state visit to China. In this period, US and China had in-depth talks about deepening economic and trade ties between the two parties. On November 8, as a major result of this visit, President Gong Yueqiong of Foton Motor Group and President & CEO Paul Doherty of TDG (The Digit Group) signed MOU of Smart Cities Public Transportation Solutions in the Great Hall of the People in Beijing, China. Vice Premier of China Wang Yang and US Commerce Secretary Wilbur Ross witnessed the signing ceremony. Both parties will push forward solutions of smart cities public transportation and application of intelligent transport facilitate development. Foton Motor Group is China’s largest group of commercial vehicles. TDG is the top supplier specialized in designing and building world smart cities, and leader in developing innovative solutions to smart cities. The partnership is one of the results of US-China corporate cooperation made by the first visit by American President Donald Trump to China, revealing that Foton Motor, as the benchmark and barometer of China’s intelligent manufacturing, is contributing China solutions to world smart cities and intelligent transport. According to the MOU, Foton Motor Group and TDG, using their advantages in technologies and resources, will get in profound partnership to build and develop global leading smart cities, intelligent transport and intelligent buses such as driverless buses and green e-buses. In initial stage, TDG will work together with Foton Motor to develop e-bus products in Smart City program in Wellington of New Zealand, which will replace fossil-fuel buses. The e-bus is two meters long and more units can be linked according to the number of passengers. At the same time, the futuristic bus will drive according to the route set by GPS. At the same time, camera lens will be installed to detect obstacles so that the bus can drive and park automatically. 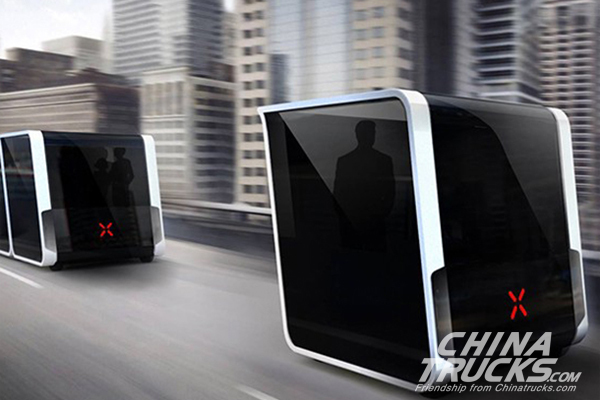 It provides the futuristic intelligent solutions to transport, featuring zero accident, congestion and pollution. Besides, TDG will use FOTON AUV e-bus for its smart city program of China and New Zealand. The total order amount will exceed over a billion USD. As plans of the two parties, TDG will focus on environmental facilities and providing solutions to energy, dynamic wireless charging technology, data analysis, LED light, visible light telecom, dynamic ads/brand communications, crossing public stops and safety. Foton Motor will provide advanced bus products and services while providing support in Internet of Vehicles and automatic driving development. In the world trend of intelligent connectivity, FOTON relies on its intelligent factory and management, uses Internet of Vehicles technology to develop intelligent and efficient products, lead the industrial trend and establish a model of US-China cooperation. In early stage, Foton Motor and Cummins co-established Beijing Foton Cummins Engine Co., Ltd. 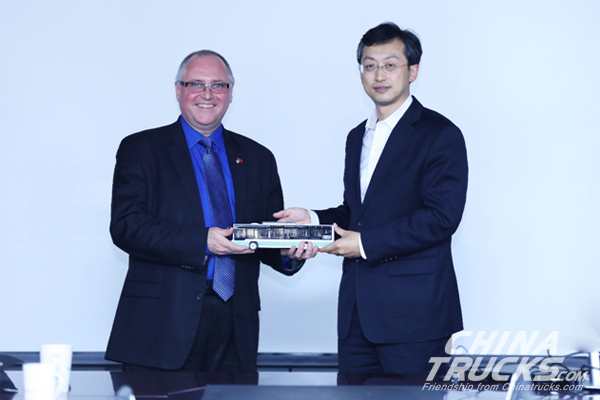 Together with ZF Friedrichshafen AG, WABCO and Continental AG, Foton Motor has established “China Intelligent Connected Super Truck Alliance”, which is dedicated to building and developing global intelligent transport and smart cities. It is learnt that as the first generation of China Super Truck, FOTON AUMAN EST series is to be launched in Russia, Peru, Thailand, etc. in 2017. 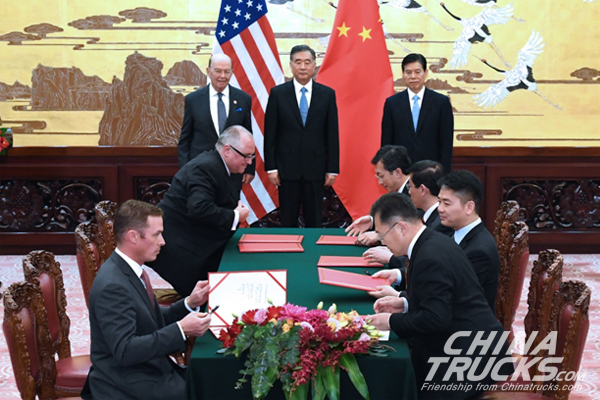 Not long ago, Foton Motor signed the deep cooperation memorandum with Cummins at U.S.-China Energy Efficiency Forum, launches the second stage of “China Super Truck” program. As the cooperation of this time, FOTON will improve its intelligent industrial chain, which will become the new driving force that stimulates corporate intelligence and innovations with global vision.